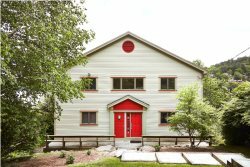 Sunset Retreat is located on private, picturesque Lake Todd and offers a feeling of quiet seclusion while still being only a few minutes drive to Mount Sunapee, local eateries, the best farm stand in the area and easy access to Interstate 89. You will find a plethora of stylish, upscale details -- from the massive hand hewn chestnut mantle in the great room, to the sliding barn doors and custom Spanish tile in the master bath, to stunning hardwood floors throughout. The house sleeps 10 guests and offers a relaxing, serene retreat where friends and family can gather in style and comfort. The finished basement offers fun for all ages with a large screen TV and a ping pong table. The kitchen is beautifully designed and outfitted with all you will need to prepare delicious, home cooked meals. The large dining table overlooking the water is just about the best spot we know for hosting a family dinner or elegant party. The master bedroom is on the main floor and has a king bed with attached full bathroom with a standing shower. Just across from this master is a half bath. Continuing upstairs you will find a room with 4 twin beds perfect for bunking all of the kids, with two extra mattresses tucked away for overnight guests. This room also has a closet with lots of games and toys for hours of entertainment on days in. The second upstairs bedroom has a queen bed, and between the two rooms is a full bathroom to share. The beautifully finished bottom level has one more bedroom with 2 twin beds. The perfect blend of sophisticated style, modern amenities and country beauty, Sunset Retreat is the perfect getaway for the whole family.